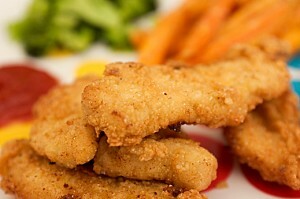 Chicken Fingers recipe by Nazia at DesiRecipes.com. Cut the chicken breast into fingers size strips. Mix lemon juice and soya sauce and marinate the chicken for half an hour. Grind dal for smooth paste. Add salt , pepper, coriander and green chillies. Heat oil in a deep pan take out the chicken fingers from the marinate and dip in a dal mixture one by one. Spread corn flakes and peanuts in a flat plate. Roll out the dal coated fingers in corn flakes and peanuts and fry till golden brown.